BBC DESIGN SPRINT: WHO'S IN? How can an app help plan a casual night out when planning is such a drag? Young adults (and old adults, too) enjoy hanging out with friends. Luckily, for young twenty-somethings, there aren't many life obligations to plan around. In theory, it should be effortless. But when interviewed, these same young adults complained that their mates may say they're up for going out later, but when the night comes around, nothing happens. Nobody takes the initiative to continue the conversation in planning the details of meeting up. Sometimes the idea inevitably fizzles. This project was the result of a week long Design Sprint by BBC's User Experience Design directors. The workshop was facilitated by BBC creatives in research, user experience and digital design. In-person interviews and desktop research exposed barriers to hanging out with friends. Committed to being non-commital is normal. Research found that it can be a priority to keep options open rather than committing. (You can’t predict what kind of mood you’ll be in on Friday night,—will you want to be dancing with friends or curled up with Netflix?) Nobody liked to be the one to make a final decision and giving a general sense of availability was preferred. Flaking on mates is both acceptable and hated. A major frustration among young adults was the inevitable dropped plan. In person, friends say they’re up for going out, but when the night arrives? Radio silence. When they would rather be out with friends, our users are sometimes left with nowhere to go. To top it off, the fear of missing out is very very real. Scrolling for the needle in a haystack is painful. 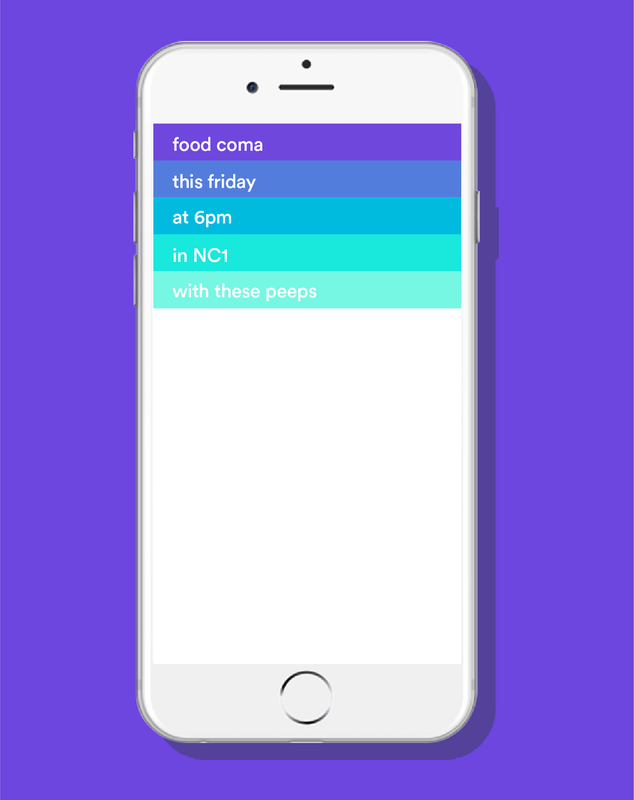 Who’s In is a simple app that helps effortlessly plan a casual night out with mates. It eliminates the fruitless back and forth of deciding on where to go and when to meet. Who's In helps the group make a decision and shares only the useful info. Kicking off the convo is low commitment. After a group of friends suggests meeting up, say, for a burger on Friday night, the conversation continues on Who’s In. One person initiates by completing a simple question. After selecting the friends in the group, everyone is pinged for a response. Conversational questions collect basic preferences. Just like in a group chat, familiar questions are asked to get a sense of when everyone is free and where they could meet. A simple swipe of a finger will visualize the user’s availability without having to commit to describing the situation. The response will give the group an idea of when everyone’s free—sans scrolling. Who’s In eliminates the pressure of making too many decisions. Through user testing, it was clear that having to make too many decisions turned people away from the app. Who’s In is meant to eliminate the hassle of planning, not to add to it. As friends give their availability, the app takes the responsibility of revealing the most common time and place to meet. The decision isn’t left to an individual or the group as a whole but is made by an objective outsider. Everyone knows what it’s like to be faced with a decision between two times to meet when neither are good for everyone—which friend gets the cut? Designed to be in on the conversation and part of the group. A casually colloquial tone of voice makes communication easier. The app’s purpose is to collect details from users and present back to the group a democratic decision. The data visualization is used as an aid to inputting information and also to understanding the results of everyone’s responses. The typeface is a familiar one in lowercase to mimic the way users type in group chats. The copy is kept short with a young tone that seamlessly continues the conversation. Who’s In continues a conversation between friends that might otherwise never materialize. Despising planning doesn’t have to mean a night on the couch. Strangers exchange gifts in complete anonymity.